Gro­wing young vege­ta­ble plants in press pots has been one of the most important pro­pa­ga­ti­on sys­tems for deca­des. Wit­hout this tech­ni­que it would actual­ly be impos­si­ble to pro­du­ce the requi­red num­bers of young plants at pre­sent. We asked Her­mann Limbers, Head of Advi­so­ry Ser­vices at Klasmann-Deilmann, about the future of this method and wan­ted to hear in par­ti­cu­lar about the future deve­lop­ment of spe­cial substrates for the pro­duc­tion of press pots. Gemü­se: Mr Limbers, why has the press pot tech­ni­que been so suc­cess­ful for more than 40 years? Her­mann Limbers: Star­ting off young vege­ta­ble plants in press pots is a very fle­xi­ble method which enab­les the pro­duc­tion of a lar­ge num­ber of plants. The­se days, press pots can be pro­du­ced in lar­ge num­bers very quick­ly using high-tech machine­ry, with only the addi­ti­on of water. One con­ti­nuous gro­wing sys­tem is used from the sub­stra­te to the press pot line and seed­ling right through to an auto­ma­tic plan­ting machi­ne, so that young plants can be rai­sed effi­ci­ent­ly in lar­ge num­bers for gro­wing on. Gemü­se: What are the most important hor­ti­cul­tu­ral advan­ta­ges of this sys­tem? Her­mann Limbers: A good blo­cking sub­stra­te ensu­res very con­sis­tent plant qua­li­ty as the press pot buf­fers water and nut­ri­ents. Once in the field, the young plants grow very quick­ly, which results in a homo­ge­ne­ous plant stock. Gemü­se: What were the most important deve­lop­ments over the last twen­ty years? Her­mann Limbers: The blo­cking substrates, press pot machi­nes and plan­ting machi­nes have repeated­ly been opti­mi­sed and modi­fied to match each other. The pro­du­cers of the blo­cking substrates have deve­lo­ped reci­pes with dif­fe­rent che­mi­cal and phy­si­cal pro­per­ties which are gea­red spe­ci­fi­cal­ly to let­tuce, corn salad, various types of cabba­ge or tomatoes, for instan­ce. One of the key aspec­ts was to opti­mi­se the sup­ply of nut­ri­ents using spe­cial NPK fer­ti­li­sers to per­mit bet­ter regu­la­ti­on of plant growth. Gemü­se: What are the most important com­pon­ents of a good blo­cking sub­stra­te? Her­mann Limbers: The main com­po­nent is still tho­rough­ly fro­zen black peat in com­bi­na­ti­on with white peat of various tex­tures. Clay pow­der not only impro­ves nut­ri­ent buf­fe­ring, but also opti­mi­ses capil­la­ry water dis­tri­bu­ti­on and water upt­ake by the press pots after they have dried. Blo­cking substrates for orga­nic cul­ti­va­ti­on con­tain 15 – 25 % by volu­me of sub­stra­te com­post. Gemü­se: What are the grea­test chal­len­ges that will face us over the next ten years? Her­mann Limbers: As a gene­ral rule, blo­cking substrates are rela­tively hea­vy becau­se of the high water con­tent. One key tar­get will the­re­fo­re be to redu­ce sub­stra­te weight in order to rai­se the loads that can be car­ri­ed by one truck. This will save trans­port costs and simul­ta­ne­ous­ly redu­ce emis­si­ons, thus impro­ving the car­bon foot­print of seed­ling nur­se­ries and sub­stra­te pro­du­cers. Alter­na­ti­ve sub­stra­te con­sti­tu­ents will beco­me more and more important, also for use in blo­cking substrates. Gemü­se: Can you pro­vi­de a few more details? Her­mann Limbers: Black peat from Ger­ma­ny is still avail­ab­le, but over the long term the avail­ab­le quan­ti­ties will decrea­se. That is one of the rea­sons why Klasmann-Deilmann began to pro­du­ce black peat in the Bal­tic back in 2010. In the cour­se of deve­lo­ping GreenFibre, the company’s own wood fib­re pro­duct, and its increa­sing use in gro­wing media, we began to con­si­der the ques­ti­on of how this could also be used in blo­cking substrates – in other words, in a seg­ment that is still domi­na­ted by gro­wing media based ent­i­re­ly on black peat. By sub­jec­ting our wood fibres to a spe­cial pro­cess, we have suc­cee­ded in deve­lo­ping blo­cking substrates with a 20 % GreenFibre con­tent which deli­vers press pots with excel­lent sta­bi­li­ty. This new genera­ti­on of blo­cking substrates has been suc­cess­ful­ly used in prac­tice for almost two years now. We also suc­cee­ded in redu­cing sub­stra­te weight even fur­ther by using peat of a spe­ci­fic tex­tu­re which means that the raw mate­ri­al com­pon­ents are more or less “net­wor­ked” in the press pot. This com­bi­na­ti­on has alrea­dy enab­led us to redu­ce the sha­re of black peat in blo­cking substrates to 50 %. Gemü­se: What con­se­quen­ces does this have for the seed­ling nur­s­e­ry? 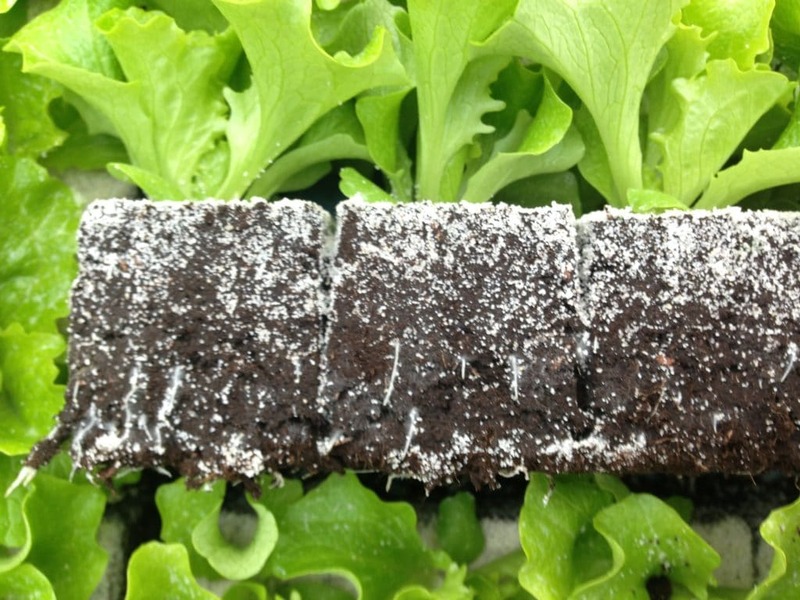 Impro­ve­ment in plant growth thanks to fas­ter root deve­lop­ment. Gemü­se: What new deve­lop­ments have the­re been for blo­cking substrates? Her­mann Limbers: Over the last few years we have exami­ned in par­ti­cu­lar tho­se fac­tors which affect the sta­bi­li­ty of press pots. In coope­ra­ti­on with the Dutch Rege­ling Han­dels Pot­gron­den foun­da­ti­on (RHP), we deve­lo­ped what is known as the “sta­bi­li­ty test”. This method allows us to simu­la­te the pro­duc­tion of press pots in the labo­ra­to­ry, to mea­su­re their sta­bi­li­ty pre­cise­ly and cal­cu­la­te the opti­mum water con­tent for each reci­pe during the pres­sing pro­cess. The next step logi­cal­ly means that seed­ling pro­du­cers will be able to mea­su­re the water con­tent on their pres­sing machi­nes. As yet the pro­du­cers of press pot machine­ry have not yet been able to deve­lop a tech­ni­cal solu­ti­on. Gemü­se: What can a seed­ling pro­du­cer do to influ­ence the sta­bi­li­ty of the press pots? Her­mann Limbers: First­ly by set­ting the opti­mum water con­tent during the pres­sing pro­cess, and second­ly by shrin­king the press pots pro­per­ly during the gro­wing cycle. Each time the press pots shrink, their sta­bi­li­ty impro­ves, and this is an important cri­ter­ion for their use on auto­ma­tic plan­ting machi­nes. Gemü­se: What will the blo­cking sub­stra­te of the future look like? Her­mann Limbers: We plan to gra­dual­ly increa­se the sha­re of alter­na­ti­ve con­sti­tu­ents in blo­cking substrates. Thanks to the com­bi­na­ti­on of GreenFibre wood fib­re and our TerrAktiv sub­stra­te com­post, blo­cking substrates with a 40 % sha­re of alter­na­ti­ve con­sti­tu­ents are alrea­dy suc­cess­ful­ly used in prac­tice. The­re are no fur­ther alter­na­ti­ve con­sti­tu­ents in sight right now, but it is con­ceiva­ble that glues could be fur­ther deve­lo­ped for use in prac­tice. To date, the­se addi­ti­ves can­not be used on a com­mer­ci­al sca­le, but our pro­duct deve­lop­ment experts are alrea­dy tack­ling this chal­len­ge. Gemü­se: Thank you for the inter­view. This arti­cle appeared in issue 1/2017 of the tra­de jour­nal “Gemü­se”.